<h2>Seaweed-powered trucks - hope or hype?</h2><br /><p>‘The potential is there, all the data points to it,’ said Dr Jaap van Hal, innovation manager at ECN, part of TNO (formerly Energy research Centre of the Netherlands). ‘But you have to learn how to crawl before you can walk.’</p> <p>Each year&nbsp;<u><a href="http://www.fao.org/3/a-i3720e.pdf" target="_blank" rel="noopener noreferrer">25 million tonnes of seaweed is harvested</a></u>, most of which is in Asia and used for human consumption and cosmetics. The industry is small in global terms, but in the last few years researchers found out seaweed could also be used as a sustainable alternative for livestock feed, chemicals and energy.</p> <p>Unfortunately, the infrastructure for such applications is still in its infancy. And before the public or private sector can scale up such solutions, more knowledge is needed to guarantee its sustainability credentials while also proving they could work in the market.</p> <p>One promising application is to use seaweed as a sustainable alternative to fossil fuels. Dr van Hal is the scientific coordinator of a project called&nbsp;<a href="http://www.macrofuels.eu/">MacroFuels</a>&nbsp;which is aiming to put in place all the steps to develop an industry for producing biofuels from seaweed – from cultivation to fuel production and testing - that could power heavy transport including trucks and ships with diesel engines.&nbsp;</p> <p>But Dr van Hal says this type of clean energy cannot be developed over night.</p> <p>‘First we have to look at high-end applications like cosmetics, then you can have a ten-hectare field, then you grow it to a hundred and a thousand,’ said Dr van Hal. ‘This is one of the steps in a long line of developing seaweed as an alternative sustainable raw material source.’</p> <p>Dr van Hal says that to turn seaweed into a sustainable energy source requires a supply on a ‘huge scale’, but currently it is a ‘dot on the horizon’ that they will work towards.</p> <p>Should all the steps be put in place, however, seaweed’s environmental credentials compared with that of other crops mean it has the potential to not only replace fossil fuels but also improve on the sustainability of current biofuels.</p> <p>Scientists are beginning to realise that seaweed has an <a href="https://www.nature.com/articles/ngeo2790" target="_blank" rel="noopener noreferrer">important role to play</a> in terms of storing carbon dioxide that is taken from the atmosphere. ‘Current assessments of the cultivation process reveal that each tonne of seaweed we produce actually stores more CO2 than the amount of seaweed produced,’ said Dr van Hal. &nbsp;</p> <p>Unlike other crops, seaweed cultivation also does not need fresh water, arable land or added fertilisers to grow, which would cut emissions associated with irrigation, deforestation and manufacturing of conventional biofuel ingredients like maize.</p> <p> <div class="quote-view quotesBlock quote_horizontal"> <div class="quotesTop"><img src="https://horizon-magazine.eu/sites/all/themes/horizon/images/quotes_top.png" alt="" title="" /></div> <p>‘First we have to look at high-end applications like cosmetics, then you can have a ten-hectare field, then you grow it to a hundred and a thousand.’</p> <blockquote><p>Dr Jaap van Hal, innovation manager, ECN</p></blockquote> <div class="quotesBottom"><img src="https://horizon-magazine.eu/sites/all/themes/horizon/images/quotes_bottom.png" alt="" title="" /></div> </div> </p> <p>Seaweed cultivation could also help tackle the problem of nutrient runoff from fertilisers used in farming. ‘To a certain extent it will also help remediate excess nutrients (from artificial fertilisers) in the sea by removing them because seaweed absorbs those nutrients. One of the side streams of the project is then using these minerals in the seaweed as organic fertilisers,’ said Dr van Hal.</p> <p><strong>Momentum</strong></p> <p>MacroFuels researchers have been harvesting seaweed from their own one-hectare farm where they hope to lay the foundations of an environmentally focused industry. As part of this they are developing a new way of breaking down seaweed that can extract the maximum amount of sugars - the building blocks for green chemicals and biofuels. They do this by using specialised enzymes for the different types of seaweed to find the most effective process.</p> <p>By the end of the project in 2019 the researchers hope to have enough evidence to back a pilot project that could see their sustainable seaweed supply chain begin to grow.</p> <p>But it’s not just biofuels where researchers see potential. In Norway, a start-up called&nbsp;<a href="https://alginor.no/" target="_blank" rel="noopener noreferrer">Alginor&nbsp;</a>is already looking to expand the range of applications for European seaweed by harvesting wild supplies in the North Sea region, which they say contains large amounts of seaweeds.</p> <p>As part of a research project called&nbsp;<u><a href="https://cordis.europa.eu/project/rcn/207951_en.html" target="_blank" rel="noopener noreferrer">AORTA</a></u>, they are developing a biorefinery that focuses on total utilisation of the entire plant. They are creating ingredients that could be used for biodegradable food wrap or bottles, feed additives, natural pharmaceutical products and crop products like fertilisers.</p> <p><strong>Environmental impact</strong></p> <p>Alginor’s SME project manager, Kjetil Kristiansen, says that current harvesting and processing practices create large amounts of pollution because of the chemicals used in the production of seaweed products, like preservatives.</p> <p>A 2016 report from the <a href="http://inweh.unu.edu/wp-content/uploads/2016/09/unu-seaweed-aquaculture-policy.pdf" target="_blank" rel="noopener noreferrer">United Nations</a> (UN) says that the seaweed industry is undergoing a rapid global expansion and, as with any rapidly expanding industry, this can result in unforeseen ecological consequences such as the introduction of non-indigenous pests and a reduction in genetic diversity.</p> <p>Some industrial seaweed farms also use algaecides and pesticides to prevent unwanted algae or fight pests and diseases. According to the UN, this has 'unknown but likely detrimental&nbsp;consequences for the wider marine environment'.</p> <p>Alginor’s biorefinery aims to ensure sustainability by using 100% of the wild seaweed they harvest. Their approach to turning seaweed into usable products will also use less water and chemicals than mainstream processes.</p> <p>Kristiansen said: ‘Today’s (seaweed harvesting and processing) technology inefficient, as well as rough on the environment. State-of-the-art (production) is utilising only a fraction of the raw material, whereas we are working towards total utilisation.’</p> <p>To maintain the environmental advantages of seaweed as they scale up production, Dr van Hal and the MacroFuels team are also looking at maximising utilisation of their crop for biofuel and examining the environmental impacts of their farming. They are working with other researchers that study how best to use the limited space in the North Sea to create a sustainable seaweed supply chain.</p> <p>And, should they succeed, Dr van Hal says biofuels are just the start.</p> <p>‘Seaweed-to-energy is only a small part of a blue growth revolution towards sustainable use of the sea for a local production of raw materials for energy, food and chemicals,’ he said.</p> <p> <div class="moreInfoBlock"> <h3>Seaweed in our everyday lives</h3> <p>You may not know it, but you've most likely used seaweed in the last 24 hours. Seaweed is surprisingly ubiquitous in everyday life. From being a thickening ingredient in toothpaste to a cement strengthening additive, kelp is also used in many cosmetic products and in dietary supplements.</p> <p>Current research is exploring how to create sustainable seaweed-based biofuels that can one day power boats, cars and airplanes. Seaweed, also processed to make yarn and with cashmere, is being used to develop a stronger, <a href="http://kth.diva-portal.org/smash/record.jsf?pid=diva2%3A1247304%22&amp;dswid=-1213" target="_blank" rel="noopener noreferrer">more resilient fibre</a>.</p> </div> </p> <p><em>The research in this article was funded by the EU. If you liked this article, please consider sharing it on social media.</em></p> <br /> <img src=”http://www.google-analytics.com/collect?v=1&tid=UA-40077089-1&cid=seaweed-powered-trucks---hope-or-hype&t=event&ec=republish&ea=read&el=seaweed-powered-trucks---hope-or-hype&cs=republish&cm=republish&cn=republish&cm1=1" /> This post <a href="https://horizon-magazine.eu/article/seaweed-powered-trucks-hope-or-hype.html">Seaweed-powered trucks - hope or hype?</a> was originally published on <a href="https://horizon-magazine.eu/">Horizon: the EU Research &amp; Innovation magazine | European Commission</a>. Each year 25 million tonnes of seaweed is harvested, most of which is in Asia and used for human consumption and cosmetics. The industry is small in global terms, but in the last few years researchers found out seaweed could also be used as a sustainable alternative for livestock feed, chemicals and energy. Unfortunately, the infrastructure for such applications is still in its infancy. And before the public or private sector can scale up such solutions, more knowledge is needed to guarantee its sustainability credentials while also proving they could work in the market. One promising application is to use seaweed as a sustainable alternative to fossil fuels. Dr van Hal is the scientific coordinator of a project called MacroFuels which is aiming to put in place all the steps to develop an industry for producing biofuels from seaweed – from cultivation to fuel production and testing - that could power heavy transport including trucks and ships with diesel engines. But Dr van Hal says this type of clean energy cannot be developed over night. Dr van Hal says that to turn seaweed into a sustainable energy source requires a supply on a ‘huge scale’, but currently it is a ‘dot on the horizon’ that they will work towards. Should all the steps be put in place, however, seaweed’s environmental credentials compared with that of other crops mean it has the potential to not only replace fossil fuels but also improve on the sustainability of current biofuels. Scientists are beginning to realise that seaweed has an important role to play in terms of storing carbon dioxide that is taken from the atmosphere. ‘Current assessments of the cultivation process reveal that each tonne of seaweed we produce actually stores more CO2 than the amount of seaweed produced,’ said Dr van Hal. Unlike other crops, seaweed cultivation also does not need fresh water, arable land or added fertilisers to grow, which would cut emissions associated with irrigation, deforestation and manufacturing of conventional biofuel ingredients like maize. Seaweed cultivation could also help tackle the problem of nutrient runoff from fertilisers used in farming. ‘To a certain extent it will also help remediate excess nutrients (from artificial fertilisers) in the sea by removing them because seaweed absorbs those nutrients. One of the side streams of the project is then using these minerals in the seaweed as organic fertilisers,’ said Dr van Hal. MacroFuels researchers have been harvesting seaweed from their own one-hectare farm where they hope to lay the foundations of an environmentally focused industry. As part of this they are developing a new way of breaking down seaweed that can extract the maximum amount of sugars - the building blocks for green chemicals and biofuels. They do this by using specialised enzymes for the different types of seaweed to find the most effective process. By the end of the project in 2019 the researchers hope to have enough evidence to back a pilot project that could see their sustainable seaweed supply chain begin to grow. But it’s not just biofuels where researchers see potential. In Norway, a start-up called Alginor is already looking to expand the range of applications for European seaweed by harvesting wild supplies in the North Sea region, which they say contains large amounts of seaweeds. As part of a research project called AORTA, they are developing a biorefinery that focuses on total utilisation of the entire plant. They are creating ingredients that could be used for biodegradable food wrap or bottles, feed additives, natural pharmaceutical products and crop products like fertilisers. 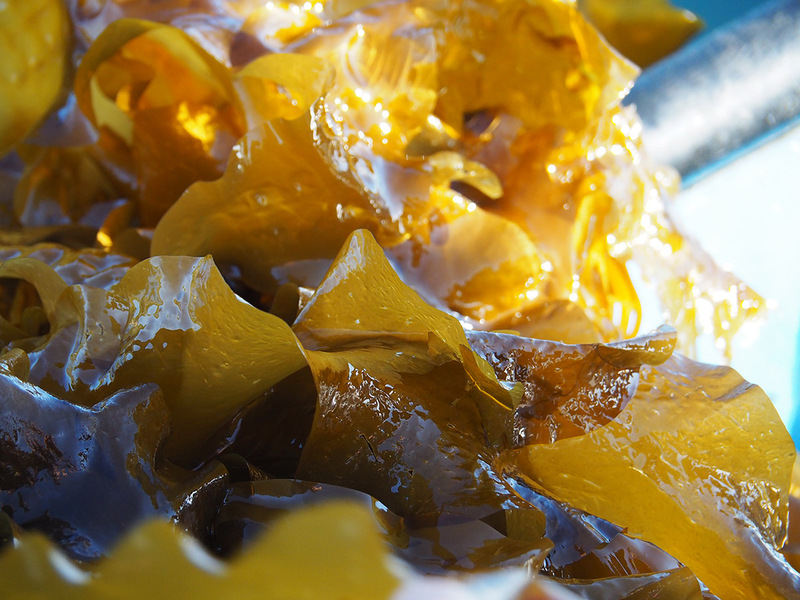 Alginor’s SME project manager, Kjetil Kristiansen, says that current harvesting and processing practices create large amounts of pollution because of the chemicals used in the production of seaweed products, like preservatives. A 2016 report from the United Nations (UN) says that the seaweed industry is undergoing a rapid global expansion and, as with any rapidly expanding industry, this can result in unforeseen ecological consequences such as the introduction of non-indigenous pests and a reduction in genetic diversity. Some industrial seaweed farms also use algaecides and pesticides to prevent unwanted algae or fight pests and diseases. According to the UN, this has 'unknown but likely detrimental consequences for the wider marine environment'. Alginor’s biorefinery aims to ensure sustainability by using 100% of the wild seaweed they harvest. Their approach to turning seaweed into usable products will also use less water and chemicals than mainstream processes. To maintain the environmental advantages of seaweed as they scale up production, Dr van Hal and the MacroFuels team are also looking at maximising utilisation of their crop for biofuel and examining the environmental impacts of their farming. They are working with other researchers that study how best to use the limited space in the North Sea to create a sustainable seaweed supply chain. And, should they succeed, Dr van Hal says biofuels are just the start. ‘Seaweed-to-energy is only a small part of a blue growth revolution towards sustainable use of the sea for a local production of raw materials for energy, food and chemicals,’ he said. You may not know it, but you've most likely used seaweed in the last 24 hours. Seaweed is surprisingly ubiquitous in everyday life. From being a thickening ingredient in toothpaste to a cement strengthening additive, kelp is also used in many cosmetic products and in dietary supplements. Current research is exploring how to create sustainable seaweed-based biofuels that can one day power boats, cars and airplanes. Seaweed, also processed to make yarn and with cashmere, is being used to develop a stronger, more resilient fibre.